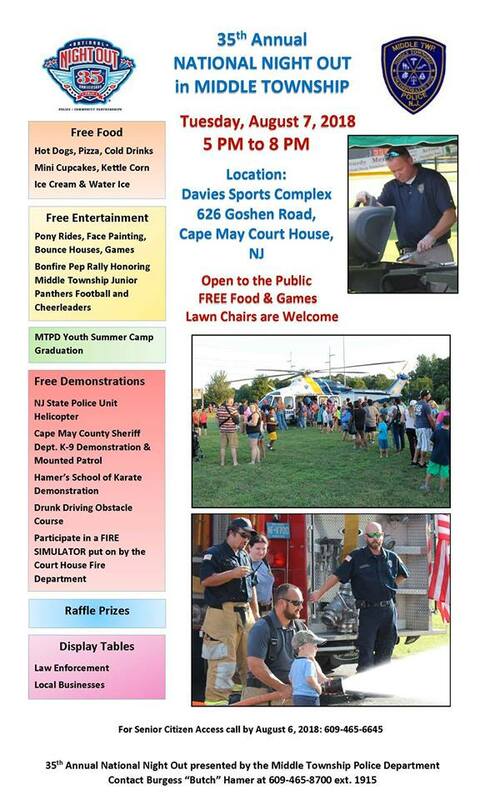 On Tuesday, August 7th from 5PM to 8PM, neighborhoods throughout Middle Township are being invited to join forces with thousands of communities nationwide for the “35th Annual National Night Out” crime and drug prevention event! National Night Out is designed to: (1) Heighten crime and drug prevention awareness; (2) Generate support for, and participation in, local anti-crime efforts; (3) Strengthen neighborhood spirit and police-community partnerships; and (4) Send a message to criminals letting them know neighborhoods are organized and fighting back! This an entirely FREE event!